I wanted to see if I could use Kismet to make a pseudo Doppler effect. My initial plan was to use the Doppler effect equation to adjust the pitch of a sound emitting object as it passed the player on any axis. However, it soon transpired that this was beyond the default functions in Kismet (I didn't know at the time that I could write my own Kismet classes) so I decided to limit the direction of travel to the x-axis, and go for a something that sounded more or less like the frequency shift you'd get with a real life Doppler. 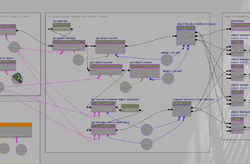 I hope to go back to this sometime to get it working on all axes, and use the equation in real-time to affect the pitch; it should be achievable using UDK with SuperCollider for example. I started off by adding my moving object and sound to the world. I found a suitable static mesh in the content browser and added it to the world as an InterpActor, then I added a siren sound as an AmbientSoundMovable, overlaying it on top of the InterpActor. To get the sound to move wherever the object moves, I hooked them up using the Attach to Actor node in Kismet and linked that to a Player Spawn event node, so that they link when the player spawns. 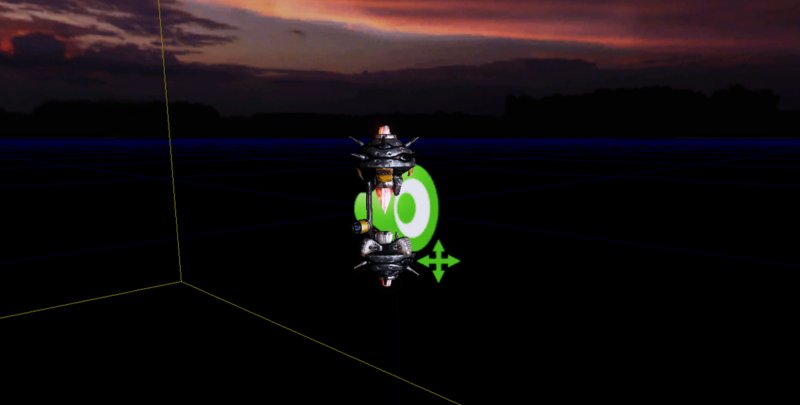 I then created a matinee sequence to move the object between two points so that it would fly back and forth over the world. Finally, I placed a DynamicTriggerVolume over the player spawn point and attached it to the player, so that I could use it to get player location co-ordinates in Kismet later on (I don't think it's possible to get co-ordinates directly from the player in Kismet). 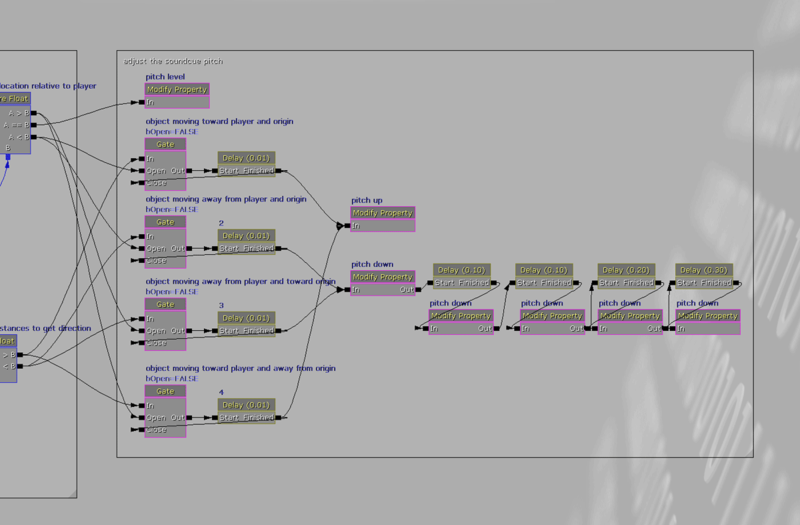 To know when to apply the pitch shift, I needed to know where the object was in relation to the player and in which direction it was travelling. With that information to hand I'd be able to tell when the object was moving toward the player; at the exact moment it started moving away from the player again, the pitch adjustment could be applied. To get the location co-ordinates, I used the Get Location and Delay nodes in Kismet to capture the player and object locations every 0.02 seconds. I used the Get Distance node to deduce the direction of travel by chaining two nodes together, separated by a delay of 0.01 seconds, and comparing the two figures (the object was attached to input A of the nodes and the DynamicTriggerVolume was attached to input B). 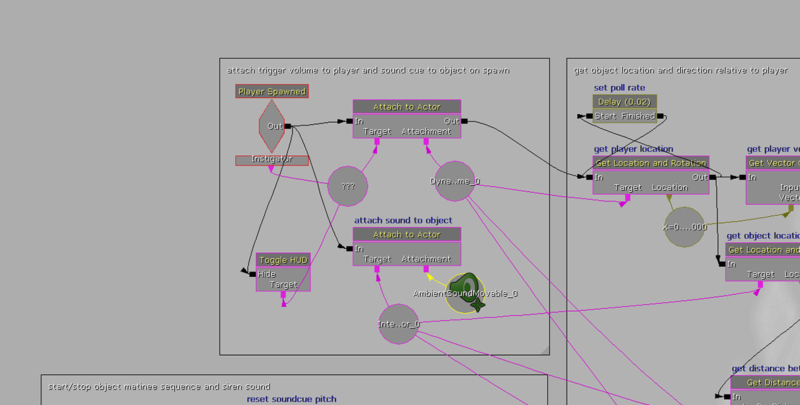 I used the Modify Property node in Kismet to change the pitch multiplier of the siren sound cue. Ideally, you'd be able to calculate the amount of pitch adjustment required in real-time and set the property value in the Modify Property node dynamically - this last bit isn't possible though. 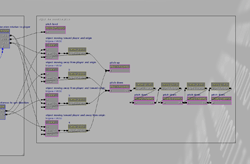 So instead, I pre-calculated what the pitch adjustment would be and applied it by chaining together five Modify Property nodes, separated by short, gradually lengthening, delays. 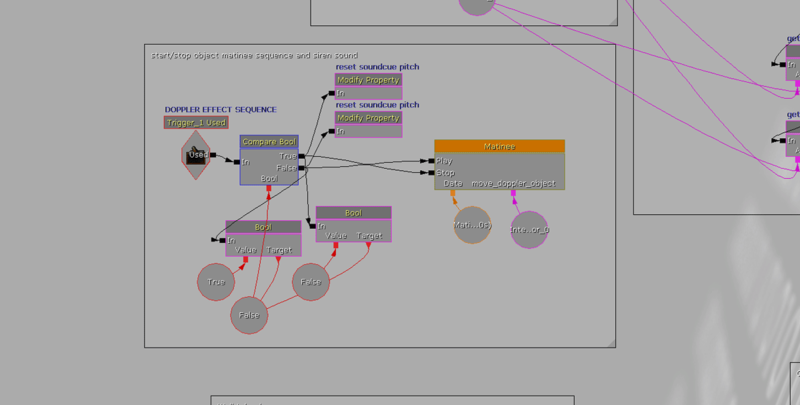 The Modify Property node can be fiddly at first - it took me a little whiler to get the right info in the right fields. Find the sound cue or (whatever you're modifying) in the content browser, right click it and Copy Full Name to Clipboard - paste that into the target field. Then look at the properties of the sound cue, find the property you want to modify (e.g. Pitch Multiplier) right-click and Copy Selected Property to Clipboard - paste that into a text editor and it should be fairly obvious which bit you need to enter in the property name field - in this case it's PitchMultiplier (note there's no space). As mentioned, this is a fairly limited Doppler, but it sounds pretty realistic in-game, and I learnt a lot about Kismet in the process! I'd like to get it working on all 3 axes for any speed, and add the player movements into the equation (not that that would make much difference to the pitch shift amount, unless maybe the player is buzzing around in a vehicle...). Hi thanks for this sound panning tutorial, u really saved my life. For i am the sound designer for my final year project and this really helps me to understand the kismet! Keep up the good work!!!! Hope to see more of your works in the future! Hi, can u message me through msn? I would like to ask u on smth. my deadline for gaming is on monday and i having loads of problem with the kismet. Hey,So I'm attempting to reacilpte this kismet in my map file, but I am having an extremely difficult time. Do you have a video tutorial that might be easier to follow? my main problem is how the object list variable works and the corresponding checkpoints. Hi I am private message you using hotmail Do reply me asap if possible as the tutorials are pretty important to me.